Émile Friant (1863–1932), The Meurthe Boating Party (Reunion of the Meurthe Boating Party) (1887), oil on canvas, 110 x 166 cm, Musée de l'École de Nancy, Nancy, France. Wikimedia Commons. Having looked at the life and work of Alexandre Cabanel, I turn now to representative works of some of his pupils: those who learned their skills, techniques, and perhaps styles and motifs in his teaching atelier at the École des Beaux-Arts. In each case, I show the earliest painting which I have by them, which should show greatest influence by their teacher, and one from the height of their Naturalist style for comparison. Tancrède Baster (fl 1883-1890), Cabanel’s Studio at the École des Beaux-Arts (1883), further details not known. Image by Zen 38, via Wikimedia Commons. Cabanel’s reputation as an excellent and influential teacher resulted in his teaching atelier being large, and often over-subscribed. This painting by the otherwise forgotten Tancrède Baster, who was active around 1883-1890, shows Cabanel’s Studio at the École des Beaux-Arts in 1883. Henri Regnault (1843–1871) was a pupil of Cabanel’s in the early 1860s, but was unsuccessful in the Prix de Rome in 1863. He won that contest in 1866, though, with his painting of Thetis Bringing the Arms Forged by Vulcan to Achilles. 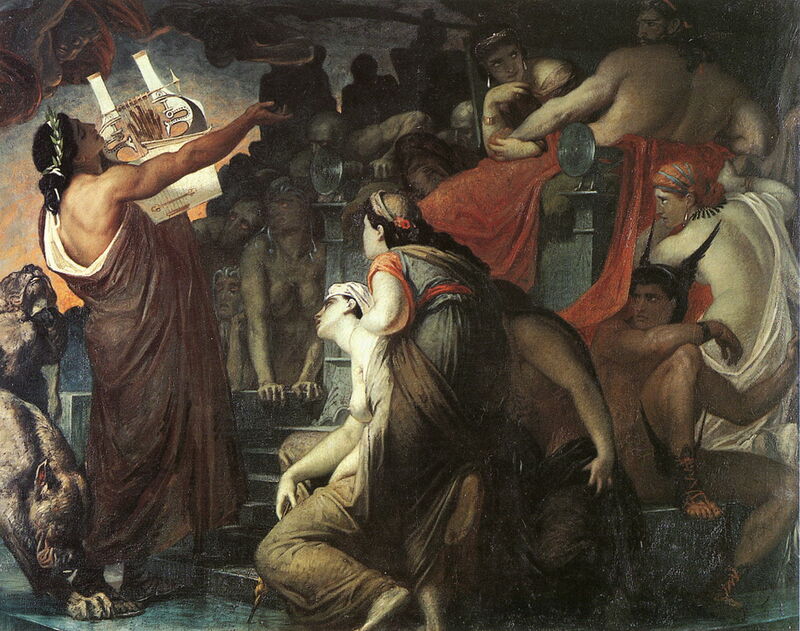 Henri Regnault (1843–1871), Orpheus in the Underworld (1865), oil on canvas, dimensions not known, Musée des Beaux-Arts et de la Dentelle, Calais, France. By VladoubidoOo, via Wikimedia Commons. Regnault’s early paintings are often dark in all senses, and tend toward the Neo-Classical in style. He quickly moved from portraiture to mythology and narrative work, often with an Oriental theme. Regnault’s Summary Execution under the Moorish Kings of Grenada (1870) achieves shock and horror through its photographic realism, and skilful use of colour contrasts. 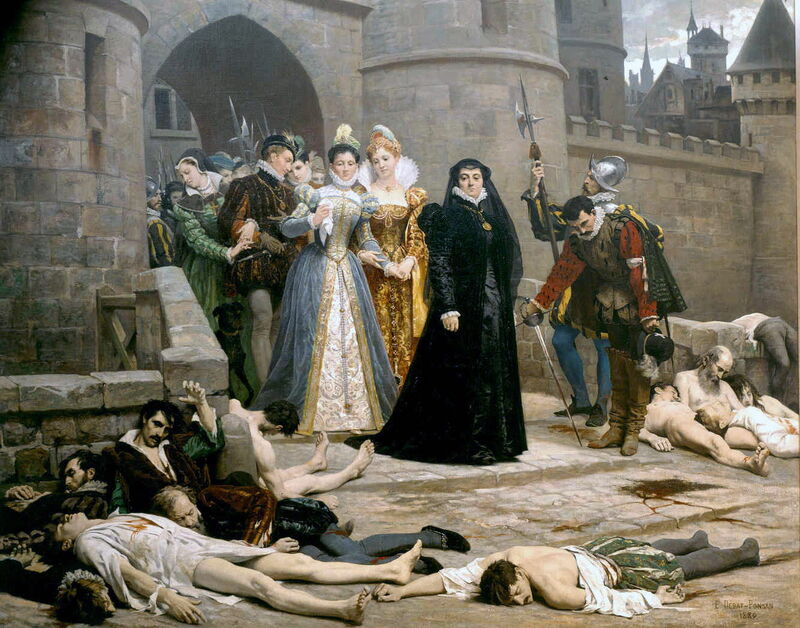 Tragically, the artist was killed in the Franco-Prussian War, on 19 January 1871. He did not live long enough to see the heyday of Naturalism, but his detailed realist style should have made him a good candidate. Fernand Pelez (1848-1913) was a pupil of Cabanel’s in the mid to late 1860s. Fernand Pelez (1848-1913), The Death of the Emperor Commodus (1879), oil on canvas on cardboard, 58 x 37.5 cm, Musée des Beaux-Arts de la Ville de Paris. Petit Palais, Paris. Wikimedia Commons. 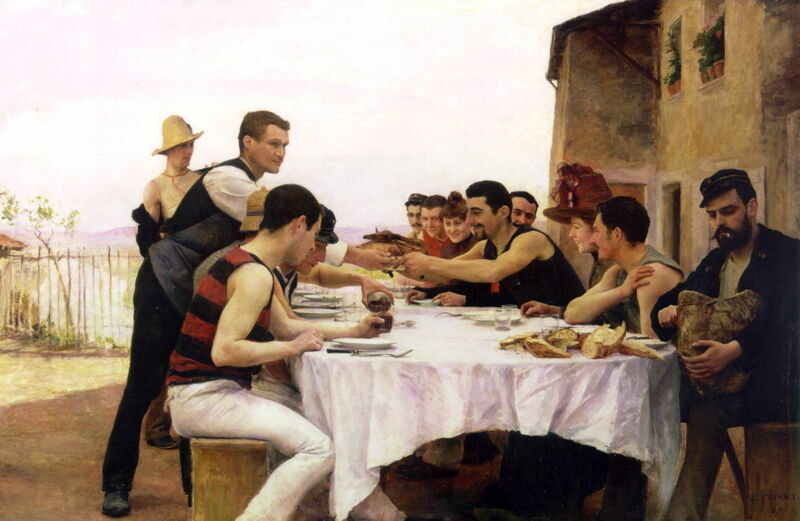 He initially painted history, as in The Death of the Emperor Commodus (1879) above, but doesn’t appear to have made much of a success of that, so in the 1880s he turned to social realism, or Naturalism. His paintings of down-and-outs through the 1880s and into the 1890s are hauntingly convincing, and culminated in a huge work showing the misery of circus performers, which was widely featured in the press. However, he was unable to follow that up, and when another major work failed in 1896, he became a recluse. Édouard Debat-Ponsan (1847–1913) was another of Cabanel’s students in the late 1860s, immediately prior to the Franco-Prussian War. 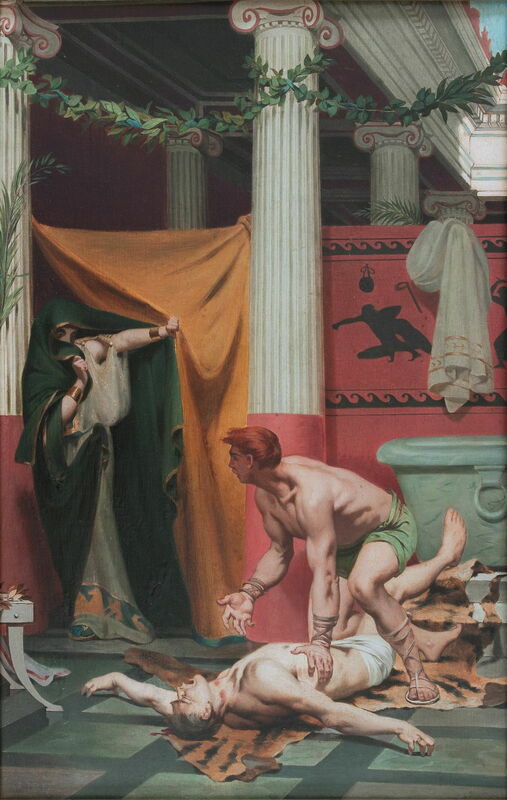 Édouard Debat-Ponsan (1847–1913), The Daughter of Jephthah (1876), further details not known. Wikimedia Commons. Debat-Ponsan didn’t win the Prix de Rome, but was awarded a travel bursary which enabled him to go to Italy. 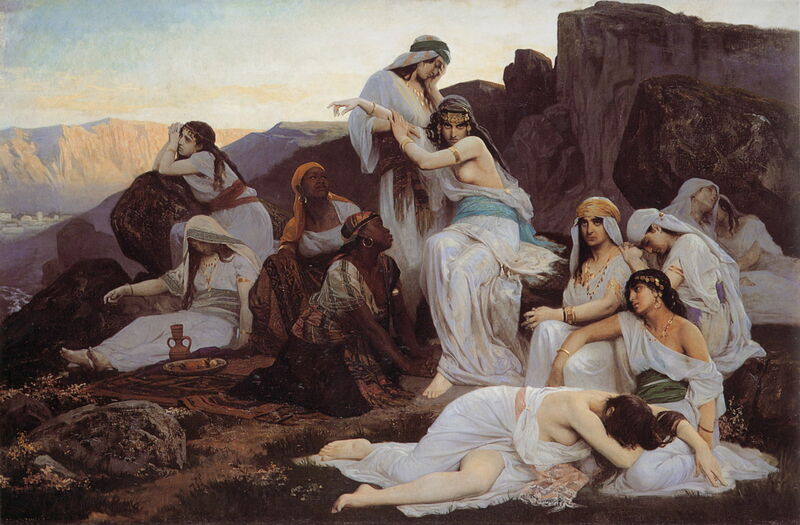 This unusual treatment of the story of The Daughter of Jephthah (1876) may have inspired Cabanel’s painting of 1879. Édouard Debat-Ponsan (1847–1913), One Morning in Front of the Louvre Gate (1880), oil on canvas, dimensions not known, Musée d’art Roger-Quilliot, Clermont-Ferrand, France. Wikimedia Commons. Although Debat-Ponsan remained a meticulously-detailed realist, he appears to have painted relatively few scenes from contemporary life in France, instead concentrating on historical metaphors – such as One Morning in Front of the Louvre Gate above – and Orientalist works. Later in his career he escaped into idyllic pastoral views. 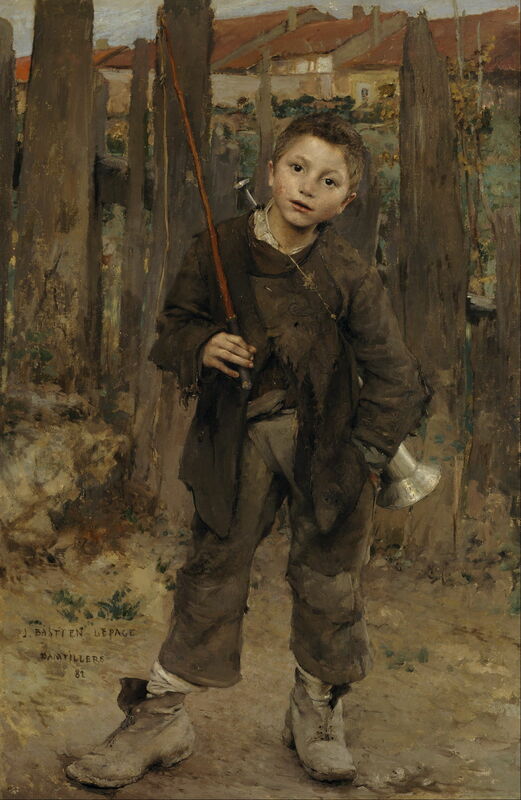 Jules Bastien-Lepage (1848–1884) studied with Cabanel in the two years prior to the war. He then struggled to get recognition at the Salon, only gaining a public following when he failed to win the Prix de Rome in 1875. 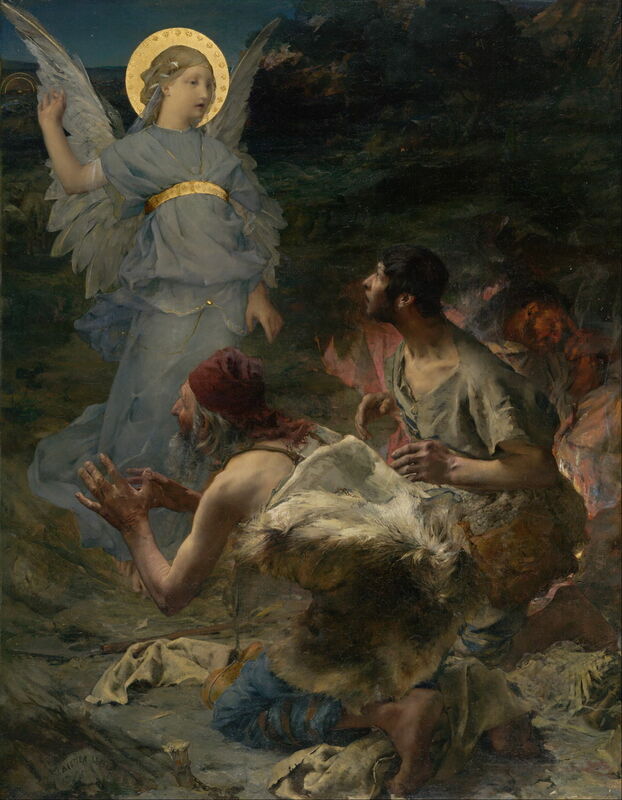 Bastien-Lepage’s entry for the competition was a curious combination of modern realism, in the shepherds, and archaism, in the angel, which I think works wondrously well. It was rejected on a technicality which was generally considered to have been trumped-up. Bastien-Lepage therefore abandoned his aspirations to be a history painter. Jules Bastien-Lepage (1848–1884), Pas Mèche (Nothing Doing) (1882), oil on canvas, 132.1 x 89.5 cm, Scottish National Gallery, Edinburgh, Scotland. Wikimedia Commons. Instead, he went and painted the rural poor, particularly in the village of his birth. These detailed social realist works became extremely popular, and the model for Naturalist painting across much of Europe. He died unexpectedly, and quite rapidly, in 1884, when at the height of his popularity. Jean-Eugène Buland (1852–1926) was one of Cabanel’s pupils in the early 1870s, who also tried to succeed as a history painter. When two entries for the Prix de Rome were unsuccessful, in 1878 and 1879, he abandoned that course and switched to painting social realist scenes of modern life, inspired by contemporary literary Naturalism. 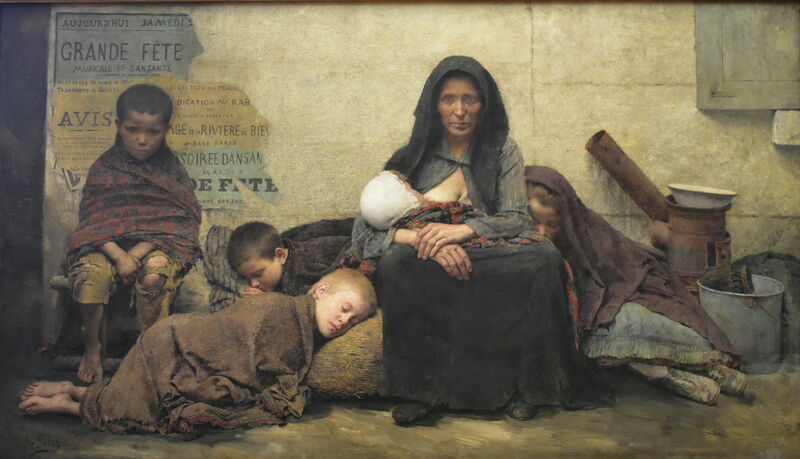 Jean-Eugène Buland (1852–1926), Alms of a Beggar (1880), oil on canvas, 117 × 89 cm, location not known. Wikimedia Commons. 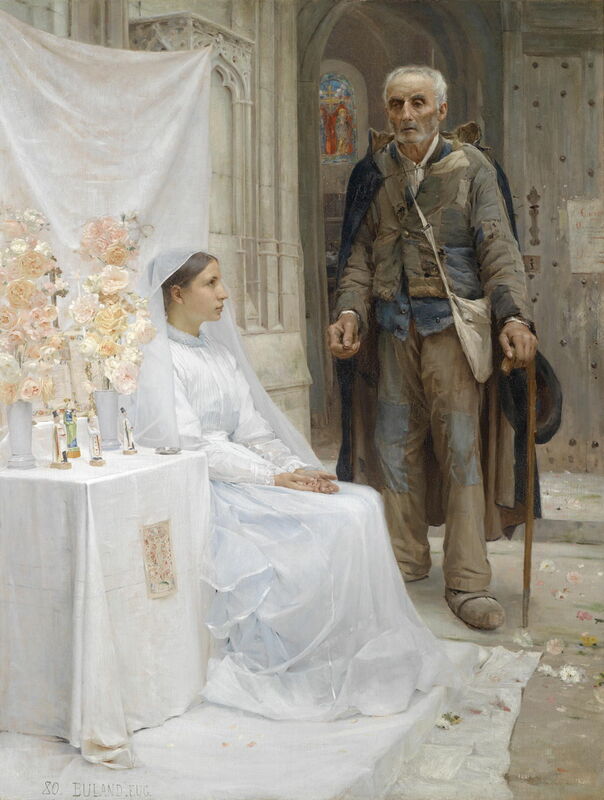 From the outset, these were in the mould of Bastien-Lepage’s Naturalism, as seen in his Alms of a Beggar from 1880, which shows an old man who is visibly poor giving charity to a young woman who hardly seems to need his money. 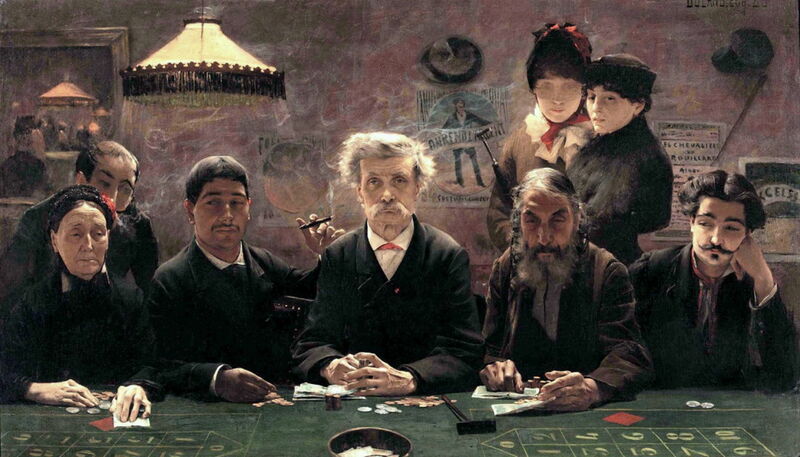 Buland’s Le Tripot (The Dive) from 1883 is one of the masterpieces of Naturalism, showing rich narrative in the appearance of this motley group of gamblers. Pascal Dagnan-Bouveret (1852–1929) started his studies at the École des Beaux-Arts just before the war, and resumed them afterwards. Although these were initially under Cabanel, he later transferred to the atelier of Gérôme. When he was unsuccessful in the Prix de Rome of 1876, he joined Bastien-Lepage in developing Naturalism instead. Dagnan-Bouveret was technically one of the most brilliant of all Cabanel’s students. 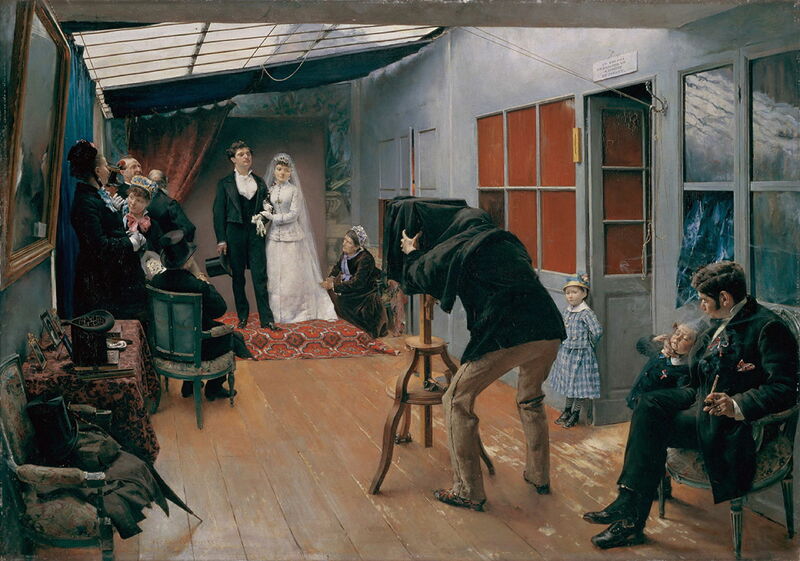 He could achieve realism of photographic quality, as shown appropriately in this Wedding at the Photographer’s from 1879. After the death of Bastien-Lepage in 1884, it was Dagnan-Bouveret who drove forward the Naturalist movement in painting, embracing many different contemporary themes, as in his Conscripts from 1889. Henri Gervex (1852–1929) was another precocious painter, who was a pupil of Cabanel’s in the early 1870s. Although he made an early debut at the Salon, when he was only twenty-one, he concentrated on mythological subjects until he joined the circle of Manet and the Impressionists in 1876. Gervex did not change his academic painting style, though. This early study is loose and painterly, but his finished works remained true to Cabanel’s tradition. 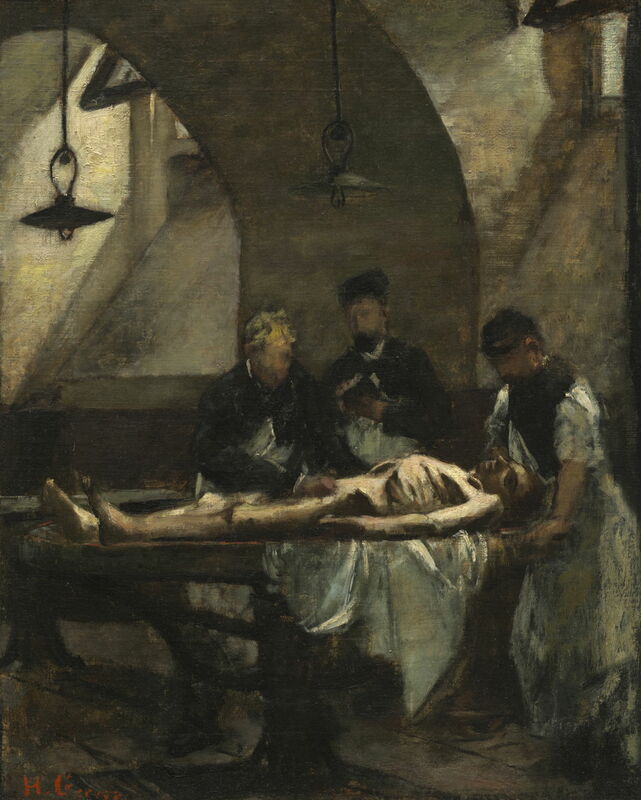 Henri Gervex (1852–1929), Before the Operation (1887), oil on canvas, 242 x 188 cm, Musée d’Orsay, Paris. Wikimedia Commons. Gervex’s quest for contemporary motifs took him into hospitals, to find medical science and treatment advancing in front of his viewers’ eyes. 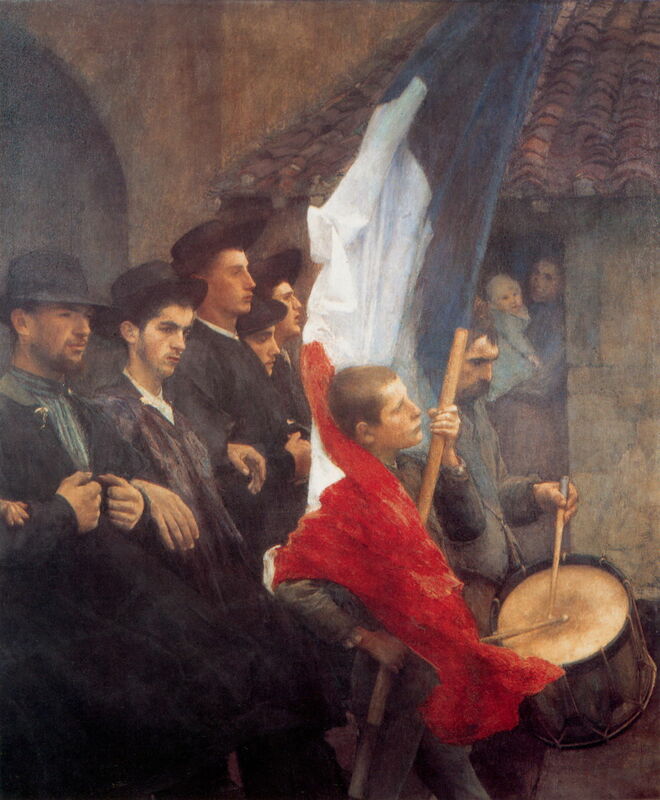 Émile Friant (1863–1932) was a pupil in Cabanel’s atelier from 1879 onwards, but he became a bitter critic of both academic painting and the academy system during that time. He too was unsuccessful in the Prix de Rome, gaining second place when he competed in 1883. Émile Friant (1863–1932), The Entrance of the Clowns (1881), media and dimensions not known, Private collection. The Athenaeum. 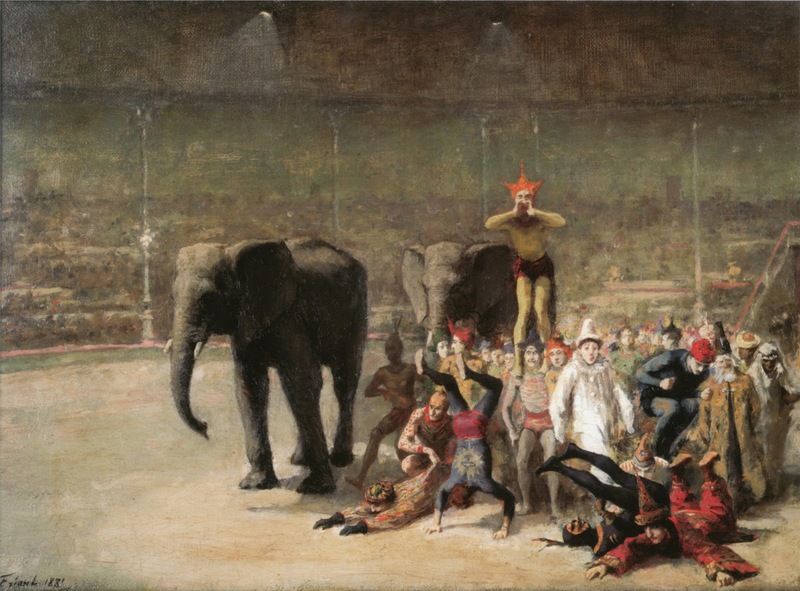 Although some of Friant’s early works are mythological, he soon turned to more diverse and contemporary motifs, such as this circus scene from 1881. Émile Friant (1863–1932), The Meurthe Boating Party (Reunion of the Meurthe Boating Party) (1887), oil on canvas, 110 x 166 cm, Musée de l’École de Nancy, Nancy, France. Wikimedia Commons. His hopes of history painting dashed, Friant returned to his home town of Nancy, where he painted some of the most quintessentially Naturalist works. Among those is his famous group portrait of The Meurthe Boating Party (1887), which is often used as an example of Naturalist painting. Many of these pupils of Cabanel were the best of their class, precocious in their skills, and destined for success. In every case, except that of Henri Regnault, they were unsuccessful when they competed for the Prix de Rome, which was intended to foster the best in history painting. Looking at the list of those who won that prize between 1860 and 1885, Regnault’s is the only name that I recognise: the other winners all vanished into history, rather than making it. The failure of the Prix de Rome to maintain history painting had a miraculous side-effect: it drove deserving but unsuccessful artists to look for new themes, and a new style which proved very successful and highly popular: Naturalism. 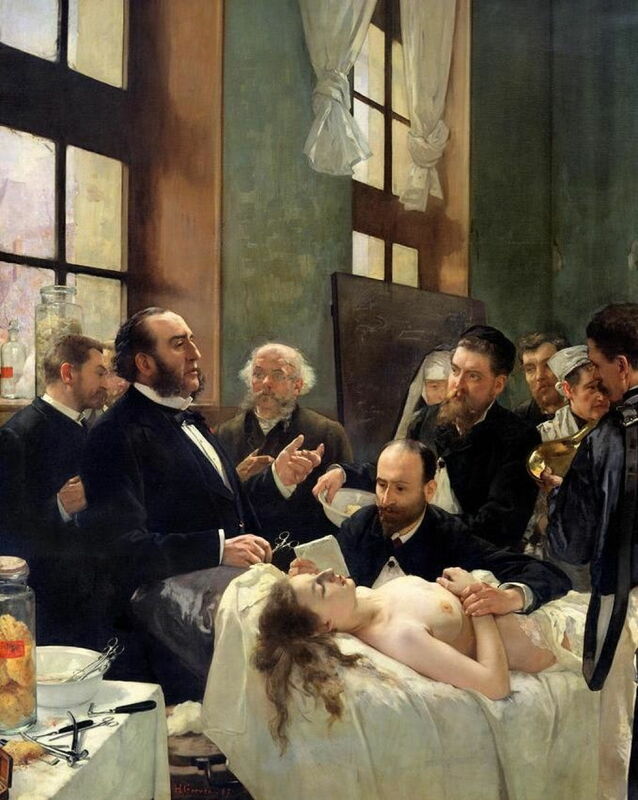 Perhaps we should consider Alexandre Cabanel to be the father of Naturalism. 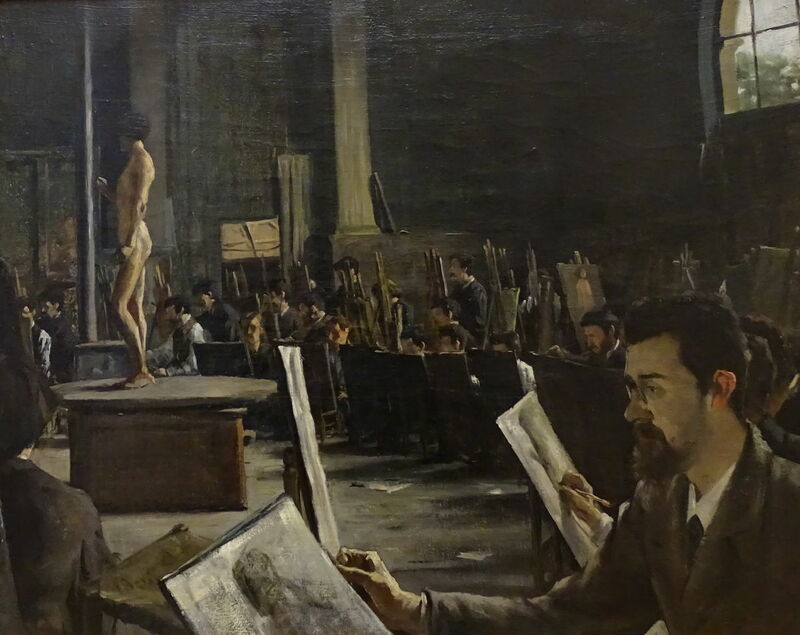 Posted in General, Life, Painting and tagged Baster, Bastien-Lepage, Buland, Cabanel, Dagnan-Bouveret, Debat-Ponsan, Friant, Gervex, naturalism, painting, Pelez, realism, Regnault. Bookmark the permalink.